MORE than 150,000 Tasmanian homes and businesses will miss out on fibre optic cable to their door because of Abbott Government changes to the National Broadband Network, a consumer group warns. Suburbs to miss out on the premium NBN service include Sandy Bay, New Town, North Hobart, Mount Stuart, Mount Nelson and many parts of the Eastern Shore. Large areas of Devonport, Burnie and Launceston would also have their service downgraded. 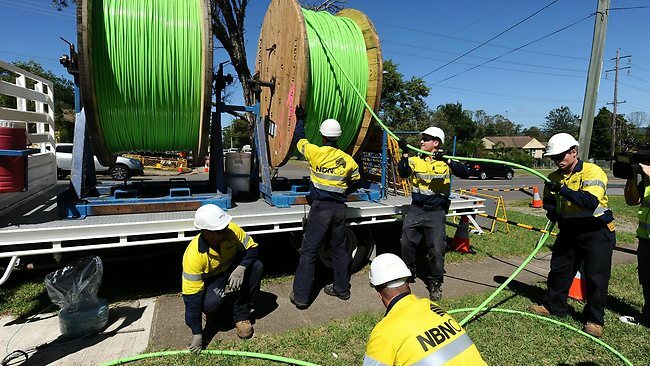 The Coalition Government's less expensive but slower NBN alternative involves fibre optic to street cabinets, with copper wire connection to the premises. Digital Tasmania spokesman Andrew Connor said new NBN maps showing only areas where the fibre optic rollout was already substantially advanced would be continued as originally planned. "NBN Co's online rollout maps have been stripped of plans to start fibre-to-the-premises construction within one to three years around the state," he said. NBN Co executive chairman Ziggy Switkowski confirmed maps were being updated on the NBN Co website. "This will provide residents with clarity around those areas where (a) the physical building of the NBN has started or (b) is about to start (c) as well as locations where services are already available," he said. "The maps will be updated when further areas enter the building stage and the shape of the rollout becomes clearer following the completion of the Strategic Review into the NBN." An NBN spokesman said: "Every community in Tasmania will still receive the NBN. Nobody misses out." But Mr Connor said the changes were contrary to a promise made by Communications Minister Malcolm Turnbull to honour existing NBN contracts. In July 2012, NBN Co announced that it had contracted Visionstream for $300 million to complete a fibre-to-the-premises rollout to 200,000 homes and businesses in Tasmania by the end of 2015. Mr Connor said the fibre-to-the-node alternative would create a digital divide between neighbouring streets and suburbs that would affect home prices. About 36,000 premises had so far been passed by the fibre optic cable in Tasmania, with up to half of those connected. He said fibre to the node would result in failures because of its reliance on the "decrepit" Telstra copper network. "City fringes will be especially affected with many areas on the previous NBN plans to be completed by 2015 having current issues obtaining any reliable fixed broadband option," he said. Civil Contractors Federation chief executive Tony Cook said the change appeared to be a matter of the definition of existing contracts. "The Federal Government has had a look at whether contracts had commenced and if the ground hasn't been broken the rollout hasn't really commenced,"he said. Premier Lara Giddings said it appeared that up to 60 suburbs had been slashed from the NBN rollout. "The Liberals' promise to honour existing NBN contracts has been shown to be a complete lie," Ms Giddings said. "Comparing rollout maps on the NBN Co website from before and after the election it appears that whole suburbs and towns have been completely abandoned." AFL TASMANIA has sought legal advice from AFL House as it awaits a formal request to appear before the public accounts committee examining state government funding of Tasmanian football. The joint house committee is investigating how the $500,000 granted annually to AFL Tasmania by the State Government is spent. 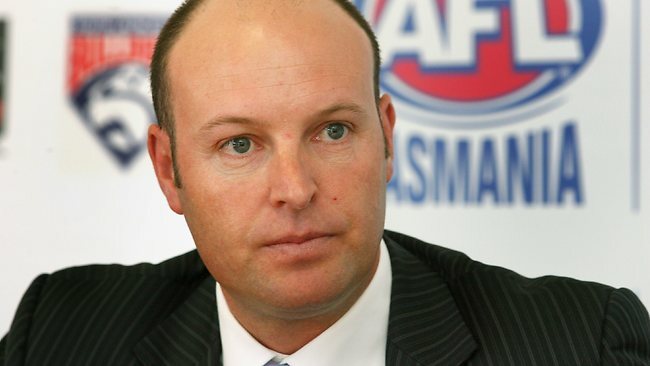 AFL Tasmania chief executive Scott Wade had previously said his organisation would not front a public hearing but was happy to give evidence in private. This earned the ire of committee chairman Windermere MLC Ivan Dean, who told the Mercury this week AFL Tasmania risked "extreme measures" if it failed to co-operate with hearings. "It is not for Scott Wade to call the shots here, it is a parliamentary accounts committee inquiry and we will convene that in the way it should be done and as openly as much as is possible," Mr Dean said. AFL Tasmania chairman Dominic Baker was tight-lipped yesterday as the sport's governing body waited for a request to front the committee. "At this point we have not formally been advised that we will be required to appear and all our comments will be made at that point," he said. Asked if AFL Tasmania would be prepared to appear in front of a public hearing, Mr Baker said: "We are in consultation with the AFL's legal team on what our requirements will be. We'll follow their advice." It is understood AFL Tasmania believes the hearings have turned into a witch hunt, as witnesses with a personal gripe against the organisation have used it as an opportunity to publicly attack the body. The committee will meet again on Wednesday where it will decide on calling more witnesses before summoning representatives from AFL Tasmania and the State Government's Department of Sport and Recreation. THE State Government will examine Hydro Tasmania's debt level after it posted a $248 million loss last financial year, just days after talking up its operating profit. Hydro was stung by taking on the Aurora Energy Tamar Valley power station, the acquisition of which wiped $335 million off its books in asset writedowns. Hydro has debt levels of $866 million after the gas-powered station was transferred at a cost of $205 million from Aurora Energy to Hydro under government energy reforms. The loss is distinct from last week's before tax operating profit of $238 million, which was mainly a result of record sales of carbon-free electricity across Basslink. Chairman David Crean said the loss was largely as a result of taking on AETV and its associated debt as well as the revaluation of hydro generation assets. "The Government has committed to reviewing our capital structure in 2013-14 to assess the sustainability of Hydro Tasmania's balance sheet following the transfer of debt from AETV," Dr Crean said. 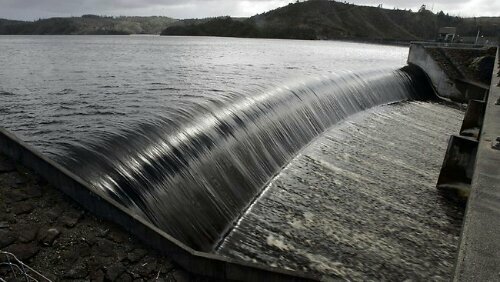 The likely abolition of the carbon tax exacerbated the writedowns of hydro power stations. "In recent years the value of generation assets increased as a result of the introduction of a price on carbon," he said. However, as a result of a range of factors, including a reduction in forecast energy and carbon prices, the value of generation assets was revised downward in 2013. Liberal Energy spokesman Matthew Groom said it was a $330 million Government stuff-up and that the Government had tried to cover it up. 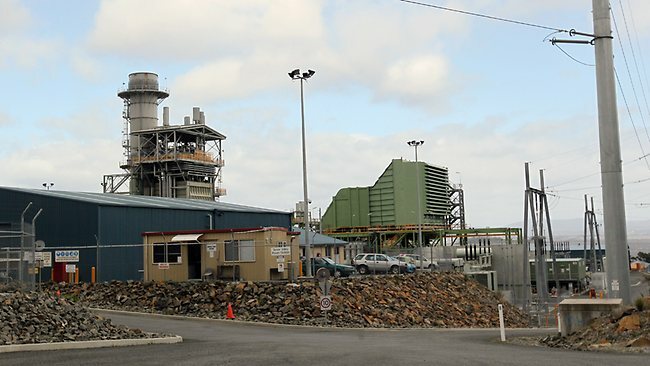 Deputy Premier Bryan Green said the revaluation of the Tamar Valley power station was a necessary adjustment under accounting standards to reflect the way it would be operated in future. He said the loss did not affect Hydro Tasmania's cash position and that the station was an important asset. The Aurora Energy Tamar Valley power station has barely operated since early July, generating just 3.34 gigawatt hours compared with an average of 34 GWh a week under Aurora. But Hydro chief executive Steve Davy said operation would resume when the current high rainfall inflows to hydro storages and rivers stopped. So what's the real story here? Aurora makes a before tax profit, yet Hydro makes a loss. This clearly means that Hydro isn't a competitive player! Just goes to show that even if the government does eventually open up the retail market for the general consumer there's no guarantee that the retail costs will be lower if the local power generation company's can't even balance the books! ENERGY giant Hydro Tasmania has recorded the largest profit in its history. The company is crediting increased revenue from renewable exports, the carbon price and increased exports across the Bass Strait for a $238 million before-tax profit for the 2012-2013 financial year. The result will bring an expected return to the Tasmanian Government during the 2013-2014 year of $263 million — including a dividend of $116 million. During 2012-13, the business returned $125 million, including a dividend of $51 million. Hydro Tasmania chair David Crean said Hydro Tasmania expected to return more than $450 million to the state in the next two years. "This was a year in which the true value of the state's 100-year investment in renewable energy was finally realised," Dr Crean said. "The performance is also notable for the increased proportion of our revenue and profit which comes from the mainland. "At the same time we continue to be a major purchaser of Tasmanian goods and services with almost $125 million spent locally during the year." Deputy Premier Bryan Green said today record returns from the Hydro to Tasmanian taxpayers demonstrated the importance of keeping the business in public hands. "This shows the enormous value of Hydro Tasmania and the dividends it pays helps ensure the Government is able to invest in core services like hospitals, schools and police," Mr Green said. "That is why we have decided not to sell or break up Hydro Tasmania or privatise our network of poles and wires that deliver electricity to homes and businesses around the state." Is it any wonder why when the topic of power price gets a mention most people just see red! This latest figure clearly shows that the Tasmanian Government is gouging as much money possible before the electricity market becomes open to commercial competition (if that still goes ahead) Tasmanians have been feeling the pinch for too long when it comes to electricity costs and this report simply rubs salt into those wounds.